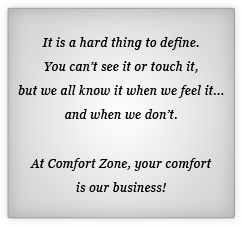 Comfort Zone is a locally owned and operated heating and cooling company with over 50 years experience combined. We serve customers throughout up state South Carolina from our Powdersville and Honea Path locations. We offer fast, friendly service by well trained and licensed technicians. 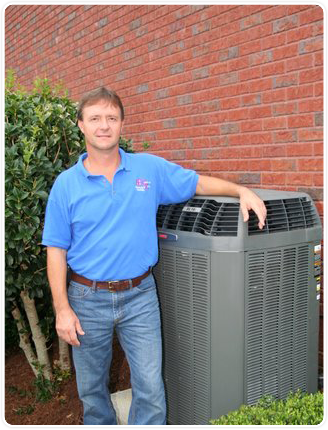 We offer the top of line heating and cooling systems from Trane. Our air conditioning professionals are trained to scientifically analyze your cooling and heating needs, and to make a precise recommendation on the unit which will give the best results. You'll be surprised at how much you can potentially save on "comfort conditioning" costs and how much more comfortable you can be. Give us a call to schedule your in-home consultation, or just fill out our contact form and we'll be in touch. All dealers are not created equal. 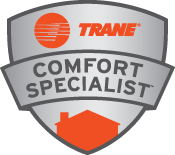 Comfort Zone is an independent Trane Comfort Specialist™ dealer, a designation that is not easy to come by. We qualify for this honor on a yearly basis by meeting Trane's strict standards for professionalism, customer satisfaction and technological expertise. When it's time to purchase a heating and air conditioning system, put your comfort in the hands of a Trane Comfort Specialist™ dealer.